When decorating your home, begin by dressing your windows and the rest of the design will follow. More often than not, windows are an afterthought when they should be the foundation of a room. Beautiful, polished treatments can ground a design by acting as a neutral or inject a pop of color for visual interest, soften harsh sunlight or even frame your view of the world. 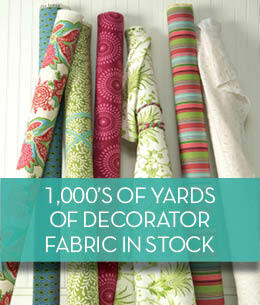 Custom-looking window treatments from Calico Corners are both fabulous and functional. 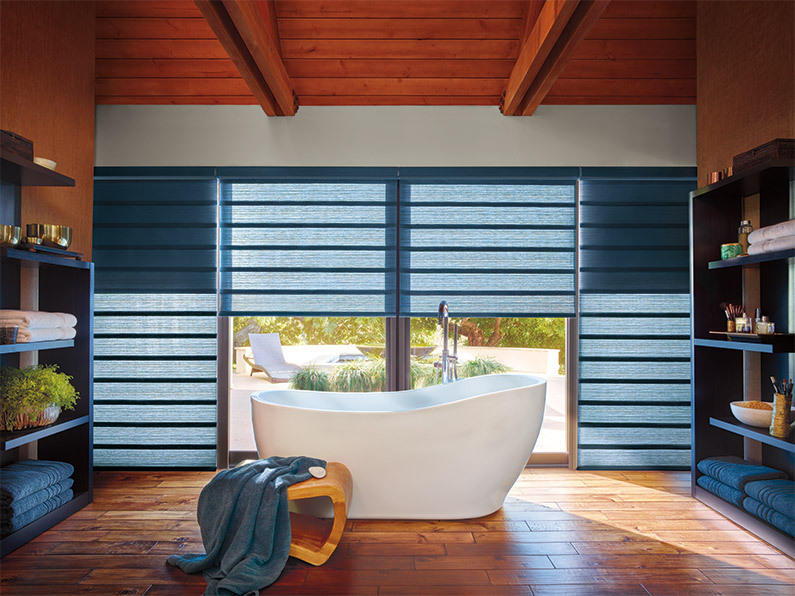 When you choose our premium window fashions from Hunter Douglas, you can also save energy, absorb sound and unify your space…while creating a style that’s all your own. Here are five things to know about window treatments. 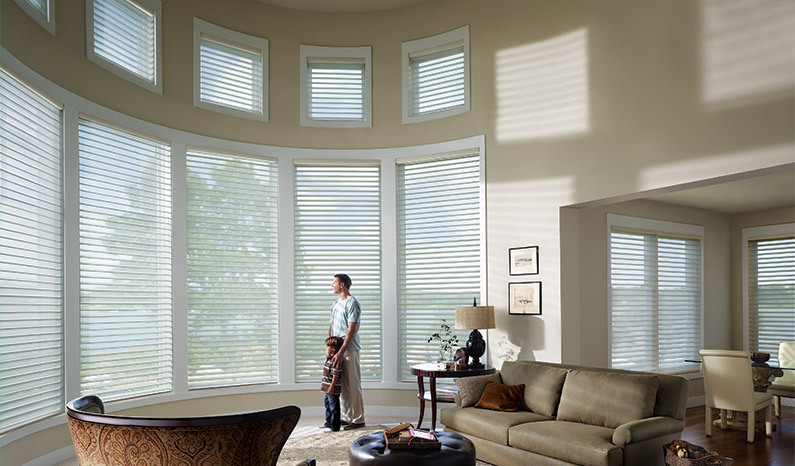 If you want a window treatment that allows for natural light and adjusts to see the outside, yet still offers privacy, blinds are your best option. However, to keep out light, opt for a blackout shade. 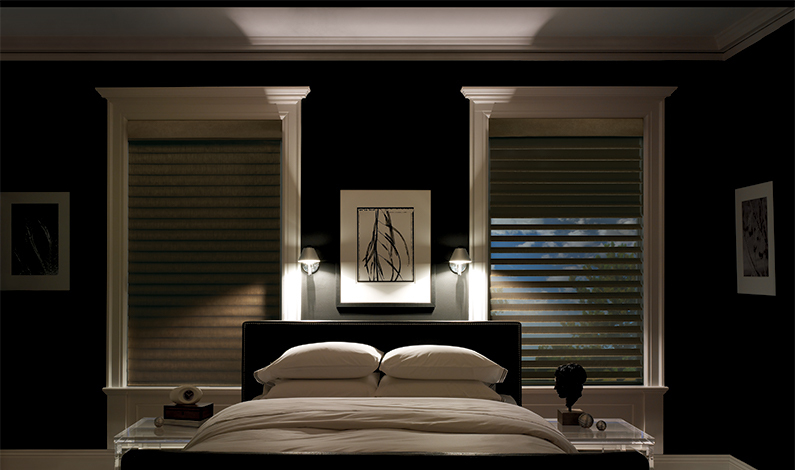 These shades are ideal for those who work non-traditional hours, want a dark place for a sleeping baby or in a media room. Window cords can be a strangulation hazard for small children so look for cordless shades that operate by pushing and pulling on the bottom rail instead. 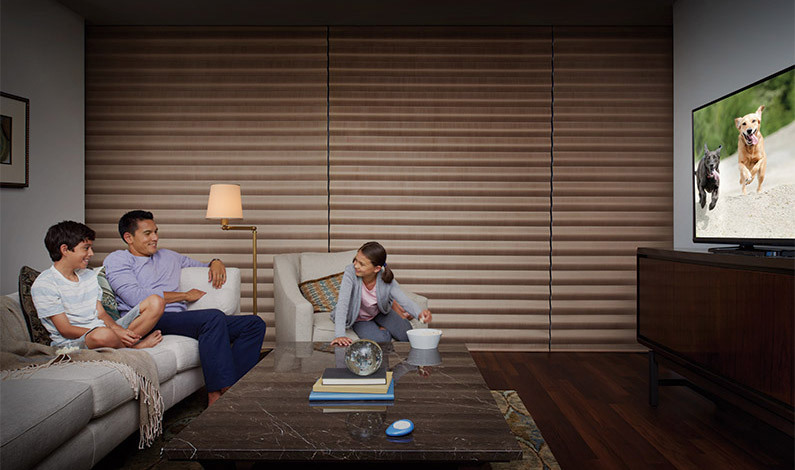 Or, get blinds with an innovative twist like an operating system or remote control that allows your window treatments to automatically adjust themselves. 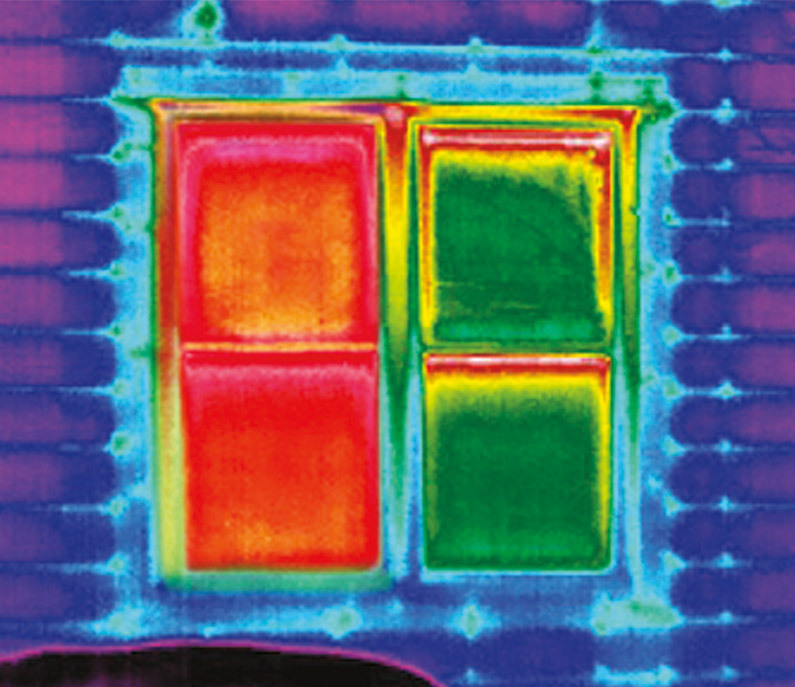 Comparison of the energy emission on a window with and without the Hunter Douglas Duette® Architella® blinds. Since a quarter of a home’s energy escapes through windows and doors, using shutters, cellular shades and wood blinds improves efficiency and saves money. After you’ve considered how your windows should function, it’s time for flair. Bold designs and unexpected hues are a great way to establish your design aesthetic and provide inspiration. Texture, contrast and shape are also important in creating that one-of-a-kind look. Top treatments are the final finish for any window design. 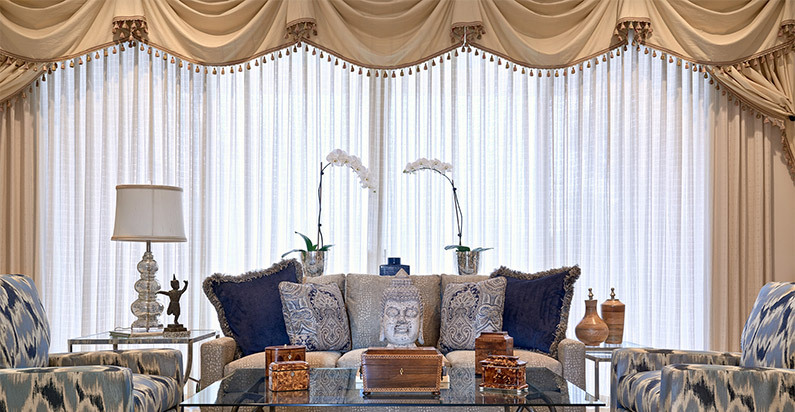 From valances to cornices, swags to scarves, these custom treatments soften the look of your room and provide architectural interest to your home. They can even help hide hardware or trick the eye into making the window look a bit larger. Complete the design by adding trim and hardware for a custom look that reflects your own unique sensibilities. Calico Corners offers in-store and in-home consultations to help you make the most of your window designs. Schedule your appointment for a design consultation today by clicking here.